At the Tooth Booth Dentist, we offer 2 different types of teeth whitening . 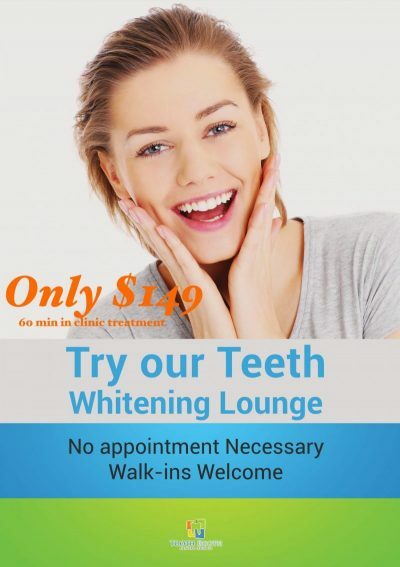 Pay only $149 for yourself or $199 and bring along and friend or family member, you can also pre-pay $199 and use the second treatment at a later date ( valid for 6 months) This is a great treatment for upcoming social occasions, or maintaining your brilliant white smile, we use only the best quality highest strength dental grade whitening products 16% HP ( this strength can only be used by Dental clinics ). Come in and experience our Whitening Lounge, we have special designed Pod chairs for your comfort. We will determine your initial shade before the treatment starts. Relax, and listening to music through our headphones in our designer Pod chairs, the complete treatment will take about 60 minutes and you will walk out with your teeth being between 5-7 shades lighter. The Tooth Booth is a Professional Dental Clinic with highly qualified Dentists and Hygienists, this allows us to offer our customers the highest strength and quality Teeth Whitening treatments, for the best results. Beauty saloons and pop up teeth whitening kiosks are legally only permitted to use very weak inferior products with very poor results. *Teeth whitening is suitable for patients 18 years and over, any patient under this age will require dental clearance to assess suitability. Brisbane Zoom Teeth Whitening. Philips ZOOM! Whitening is a 1 hour fast and effective procedure carried out in the dental chair by dentists, because of the strength of Zoom whitening gel. *$499 or We will match any advertised price of any other Brisbane and surrounding areas, Gold Coast or Sunshine Coast Dental Clinic offer (must be a current offer, patient must present proof of ad). We do not match offers from companies such as Groupon or Scoopon and alike. *Terms & Conditions: Patients may require an oral hygiene appointment before undertaking whitening treatment. Any dental services required prior to undertaking this offer will be at the patient’s expense. Offer includes 1 x in-chair teeth whitening treatment, Please refer to your health fund provider for rebate information. Cosmetic treatments may not be claimable through your health fund, Please refer to your health fund provider for rebate information. What is the difference between ZOOM! and our Whitening Lounge Treatments? Our Whitening Lounge treatments use 16% HP ( This is the strongest solution that can be used without the need to use a protective gum barrier). The results achieved with this solution is very good, from 5-7 shades whiter. This solution can only be used by Dental Clinics and is much superior to the products used in Beauty Clinics and Skin Clinics etc. Philips Zoom can only be applied by a trained Dentist and because of the strength of this solution 25% HP, the Dentist must first ascertain that the patient is suitable for this treatment. Zoom! is a world famous teeth whitening product and is clinically proven to whiten teeth up to 12 shades whiter, it’s also completely safe and does not harm or thin the tooth enamel.